With access to over 26 top LA attractions, activities and tours, the Go Los Angeles™ Card offers something for everyone! Tour Warner Bros. Studio on a VIP tour; meet your favorite celebrities at Madame Tussauds Hollywood; take a hop-on hop-off city tour; experience thrills at Six Flags Magic Mountain; one to Universal Studios and much more. 3-, 4-, 5-, and 7-Day passes have one day, skip the line, access to Universal Studios! Enjoy the flexibility to create your own itinerary and sightsee at your own pace; plus, you’ll save up to 55% on select tours, attractions, dining and shopping. Whether you’re a first-time or seasoned visitor, you’ll love this whole new way to discover Los Angeles! Enjoy direct entry to attractions. 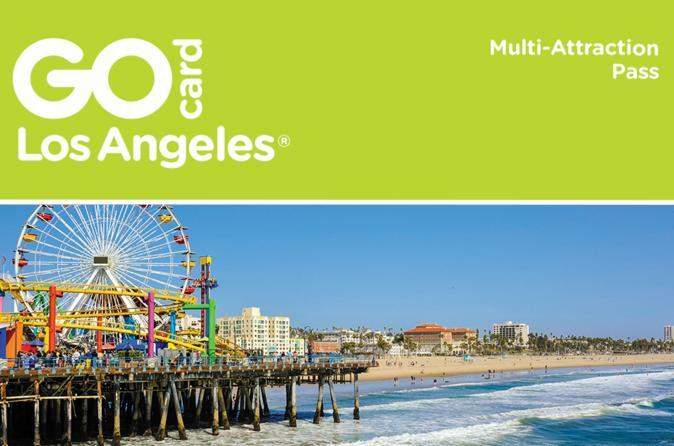 Get access to over 26 top LA attractions, activities and tours with the Go Los Angeles™ Card! A total value of almost USD $1,000, this card is available to you at one low price. Visit LA’s most popular attractions including Dolby Theatre® Guided Tour, Madame Tussauds Hollywood, Six Flags Magic Mountain and the Queen Mary, and enjoy fun activities such as a hop-on hop-off bus tour, a Malibu celebrity homes tour and an afternoon at the Santa Monica Pier Aquarium! With the purchase of a 3-, 4-, 5- or 7-day Go Los Angeles Card, you will also receive one entry to Universal Studios. This fully customizable Go Los Angeles Card lets you create your own itinerary based solely on the activities and attractions that interest you. Sightsee at your own pace and enjoy tremendous discounts and special offers at select retailers, restaurants and attractions. Choose a card valid for one, two, three, five or seven days within a 14-day period, and enjoy a complimentary, full-color pocket guidebook to help you plan your Los Angeles vacation. See the Itinerary section below for a full list of included attractions, tours and activities. Special Offer - Book with us and save over 5% compared to another travel site! - Book Now!